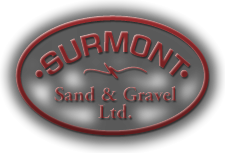 Surmont Sand & Gravel Ltd. is an Aboriginal owned and managed company that was incorporated in 2002. The consistent and strong annual sales of the company has been achieved and realized largely due to the business acumen and strong work ethics of the principle owner, David LaBoucane. David approached business with eyes wide open and not taking any unnecessary risks. His strong work ethics also demands excellence in all aspects of his company to the recruitment of good employees who know how to operate equipment and what it takes to get the job done to the Client’s satisfaction and to purchase the quality equipment. The company has an excellent reputation for getting the job done on time and on budget because if it’s permanent focus on insuring a corporate capacity to serve the Client and an unwavering commitment to Customer service. This approach to business has resulted in a strong corporate performance, growth and most important, a loyal Customer base. The company has the corporate capacity to maintain and expand its market presence, to attract and satisfy new Clients and Customers with excellent results. The most critical element of our corporate capacity is the ability to deliver services in the manner required to meet and satisfy the Customer’s expectations. Surmont Sand & Gravel Ltd. developed this Corporate Profile with an emphasis on its Corporate Capacity. We thank you for reading our Corporate Profile and are confident that you, as a potential new Client and Customer, will recognize our Corporate Capacity to be of service to you and to meet your every expectation.